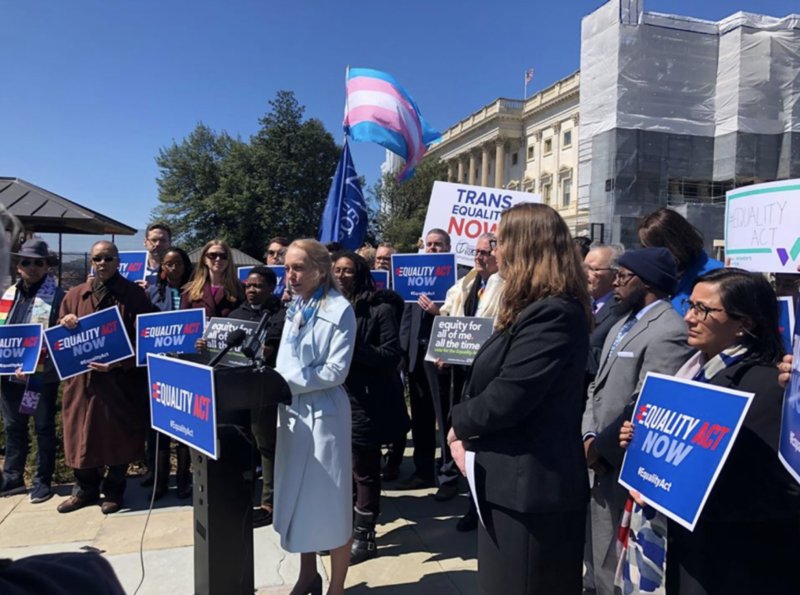 The House Judiciary Committee held the first-ever historic hearing of the Equality Act which would update federal law to include express and enduring nondiscrimination protections for Americans based on sexual orientation and gender identity across virtually every area of daily life. The day before the hearing, advocates hosted a press conference to celebrate this historic milestone. “My name is Masen Davis, and I am the CEO of Freedom for All Americans, a bipartisan campaign with one ultimate goal: to bring Americans together from all walks of life to finally secure full nondiscrimination protections for every LGBTQ American. Right now, bringing people together to support protections for LGBTQ people nationwide is more important than ever. At Freedom for All Americans we’re working hard to make victory a reality for as many people as we can, and as quickly as possible. 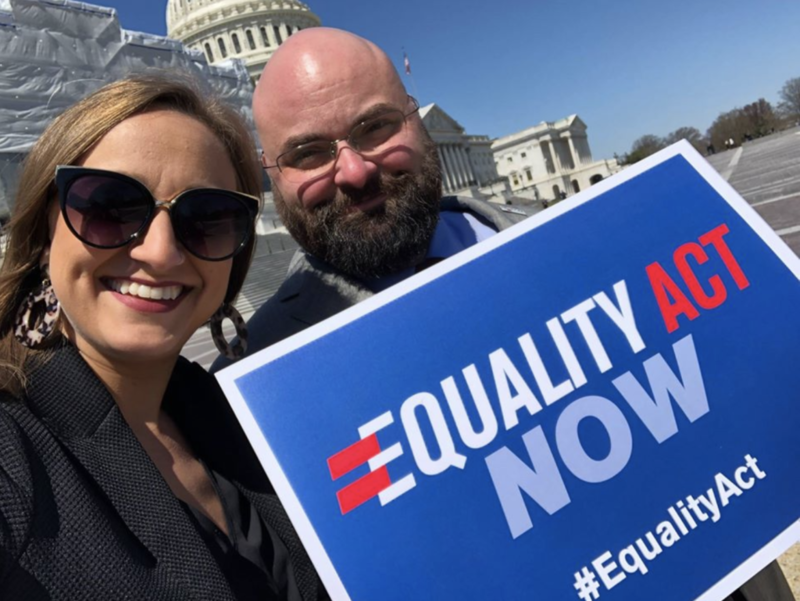 That’s why we are here today to urge Congress to pass the Equality Act and protect all LGBTQ Americans from discrimination in their daily lives. Our goal to protect LGBTQ people from discrimination isn’t about policy or politics. It’s about building a country where every one of us can go about our daily lives without the fear of discrimination or violence, no matter who we love, what we believe, where we live, or who we are. The reality is, discrimination happens to LGBTQ Americans across the country every single day. Millions of our neighbors, friends, and family members are vulnerable because 30 states lack express and enduring LGBTQ protections. Congress must act now to ensure that LGBTQ Americans can go about their lives with dignity and respect. For me, this work is about people first. I’m a gay, transgender man who grew up in a minister’s family from rural Missouri. Like many LGBTQ people, growing up wasn’t always easy. I’ve had a lot of hard conversations with people over my 20 years working in our movement, including many who identify as conservative (some of whom share my family name). Those conversations and connections were sometimes challenging, but I have found them to be important and sometimes life-changing. Over the years, I’ve witnessed profound transformations in individuals and communities alike. By being authentic, sharing our stories as LGBTQ people and allies, and tapping into common values, I know first-hand we can change hearts and minds, bringing people together to create a better future for LGBTQ youth and adults alike. The good news is, mainstream support and bipartisan momentum for protecting LGBTQ people from discrimination has skyrocketed in recent years. Support across the political spectrum has been critical to helping us pass protections in states like New Hampshire, defend protections in places like Anchorage and Massachusetts, and make important progress in states like Kansas Virginia, and Ohio. Our recent victories – and the momentum that has brought us all here today – have demonstrated that we win not by highlighting our differences, but by a shared commitment to treating our neighbors with dignity and respect.